Two photos have been taken at the same time. Compare this photo to Fitzroy Senior Team 1948 (FBLHS S48-2) and you will note that different players are looking into different cameras indicating that these two photos were taken at the same time rather than the same photographer moving and taking a second shot. There is one error in the printed label, the player far left in the middle row is Geoff Nicholls. Jack Colins and Frank Curcio played only two games together all season, and only one of those two games was a home game, which leaves Round 8. 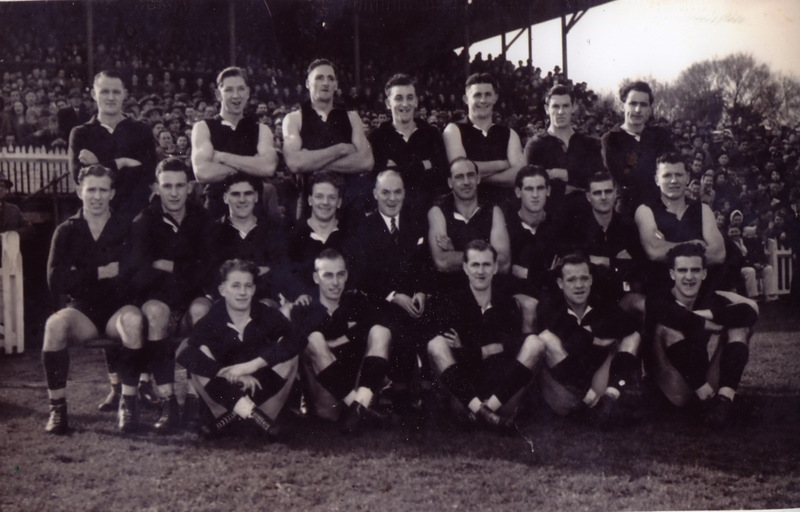 During the 1948 Season Fitzroy won 9 out their first 11 games, then had a horror run and lost all eight remaining games, falling out of the final four before the end of the season.